16 full-color 20"X24" reproductions of paintings depicting American soldiers from the Revolution to Korea. Each poster contains a brief description of the action portrayed. The following prints are available in this print set and may be ordered individually. 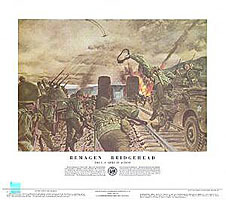 Remagen Bridghead, 7 March 1945. Here, on the Ludendorf Bridge crossing the Rhine at Remagen, Combat Command B, 9th Armored Division -- headed by the 27th Armored Infantry Battalion -- with "superb skill, daring and esprit de corps" successfully effected the first bridgehead across Germany's formidable river barrier and so contributed decisively to the defeat of the enemy. The 27th Battalion reached Remagen, found the bridge intact but mined for demolition. Although its destruction was imminent, without hesitation and in face of heavy fire the infantrymen rushed across the structure, and with energy and skill seized the surrounding high ground. The entire episode illustrates that high degree of initiative, leadership and gallantry toward which all armies strive but too rarely attain, and won for the Combat Command the Distinguished Unit Citation.